The turmoil that accompanied the Mexican Revolution (1910-1920) sent many Mexicans to the United States looking for a better life. At times the violence of the Revolution crossed the border as well. After Pancho Villa raided the town of Columbus, New Mexico on March 9, 1916, the United States Army launched an expedition to capture the Mexican general. 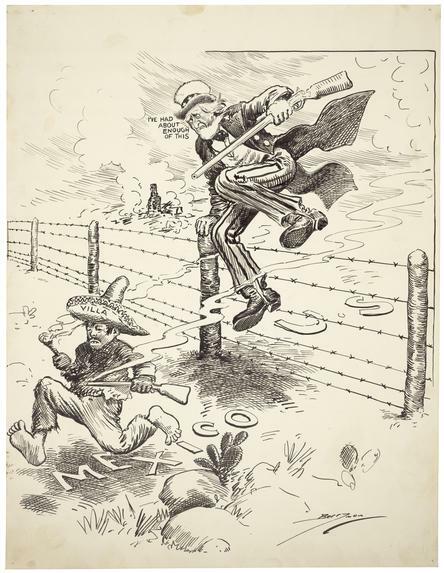 This cartoon depicting Uncle Sam hopping the border to chase Villa illustrates common stereotypes of Mexicans held by Americans at the time. Source | Clifford Berryman, "I've Had About Enough of This," Washington Evening Star, March 10, 1916 http://research.archives.gov/description/6011165. Cite This document | Clifford Berryman, “Uncle Sam Chases Pancho Villa,” HERB: Resources for Teachers, accessed April 20, 2019, https://herb.ashp.cuny.edu/items/show/2271.